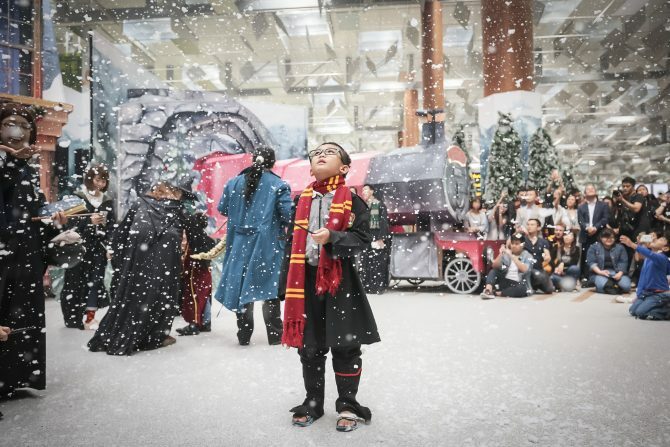 Changi Airport has transformed into a Wizarding World Holiday destination this festive season! 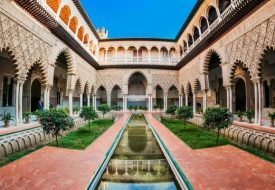 Now until mid-February 2019, you can visit Hogwarts, Diagon Alley, and Hogsmeade Village across all the three airport terminals. 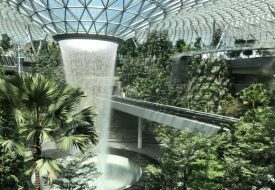 For those of us who have longed to visit the Wizarding World of Harry Potter at overseas Universal Studios parks, now we have a version of our own at Changi. A first-of-its-kind official collaboration with Warner Bros. outside of Universal Studios, A Wizarding World Holiday recreates the iconic locations from the Harry Potter movies with an extra Christmas-y touch. Lots of magical fun and games await at Diagon Alley, at Terminal 3 Departure Hall (near check-in row 11 and Starbucks). You can’t miss it, not with the brilliant red storefront facades of Weasley’s Wizard Wheezes, Quality Quidditch Supplies and more, decked out in pretty Christmas ornaments. With the Fantastic Beasts sequel now out in cinemas, the adorable Niffler from the movies takes centre stage here, as part of the Niffler Challenge Game. 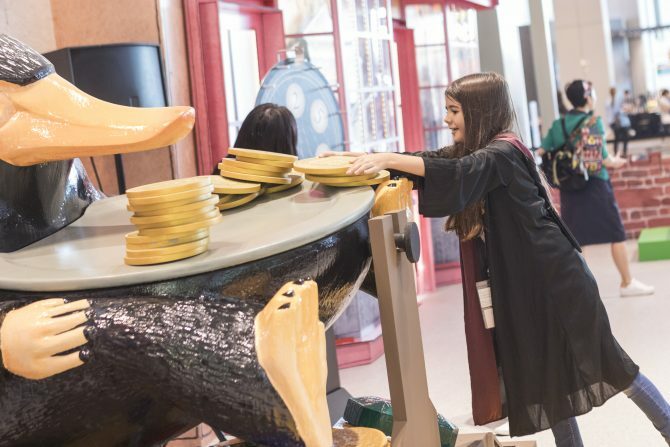 Have a friendly competition with a friend – spin the wheel for gold coins, stack them up on the giant Niffler, and see who can get the coins to topple over first. Always wanted to play Quidditch? Here’s your chance to toss a quaffle into the hoops while balancing on your broom! 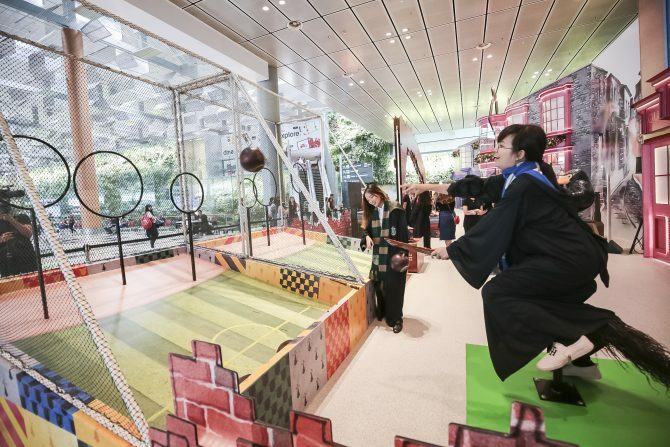 You can also practice more wizarding skills by casting a spell at the Wand Challenge. 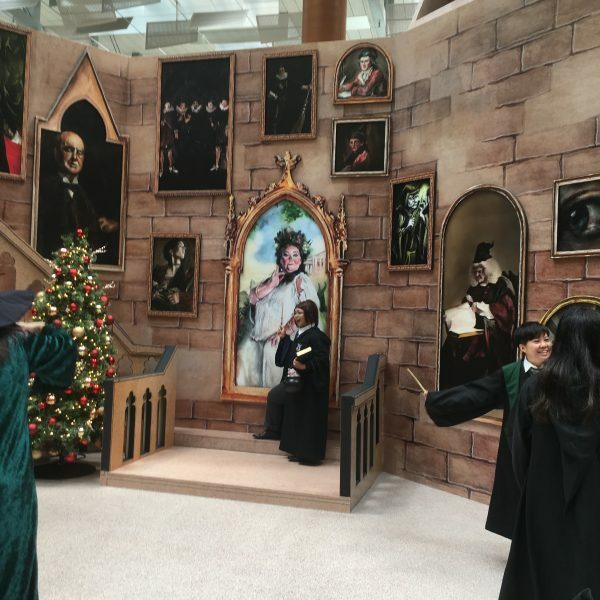 To make the experience more memorable, “A Wizarding World Holiday at Changi” has loads of awesome photo opportunities for you and your loved ones, complete with wizard and witch props! 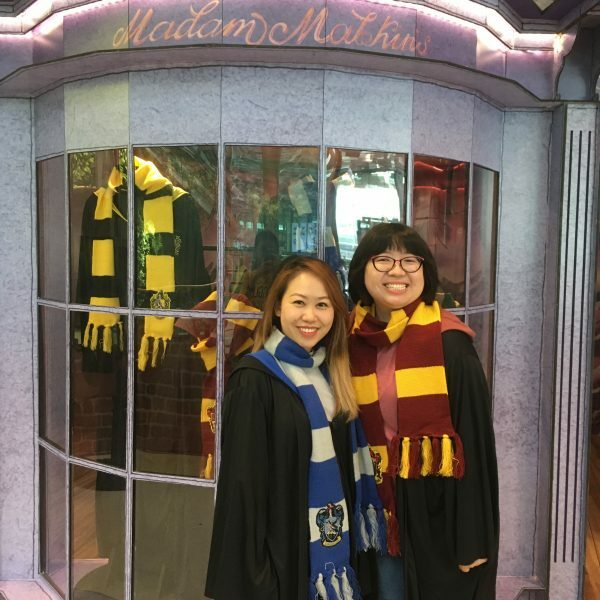 At Madam Malkin’s Robes for All Occasions, put on the student robes and scarves of your favourite Hogwarts House, and pose for a special GIF. To take part in the Diagon Alley activities, you need to first do some social media posting. 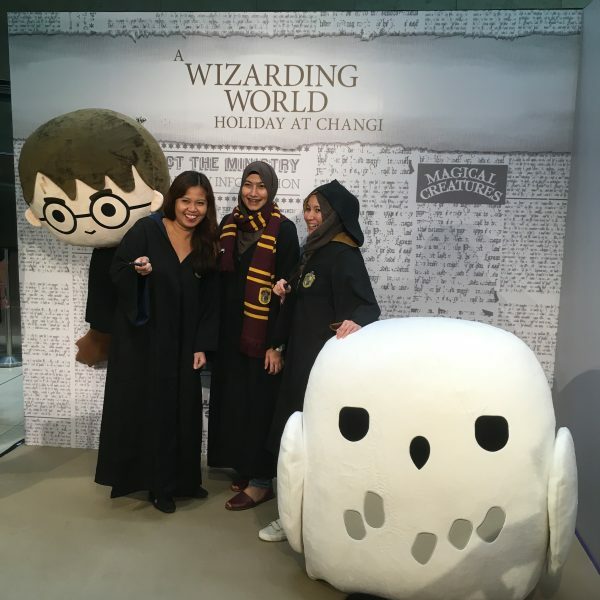 Post photos of yourself at any three of the event set-ups on Facebook, Instagram, WeChat or Weibo, with the official event hashtag #ChangiWizardingWorld. The biggest set-up of the event is Hogsmeade Village, at Terminal 3 Departure Hall. Honeydukes and Zonko’s Store line the streets, beside a big, gorgeous replica of the Hogwarts Express train. It’s best to visit the Hogsmeade set-up during the spectacular snow and light show. As our host begins to dance around the village, the place comes to life with bright Christmas lights and showers of snow. 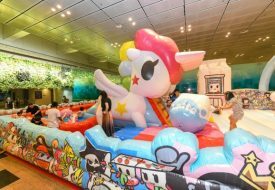 The show is held on 6pm, 7pm, and 9pm daily, with an additional 1pm show on weekends. On the other side of the Hogsmeade display are the walls of Hogwarts, featuring many of the magical paintings from the films. At 3pm and 5pm on weekends, you can get a special moving photo with the Fat Lady! Many more sets are beautifully recreated across the airport just for your photo-taking. 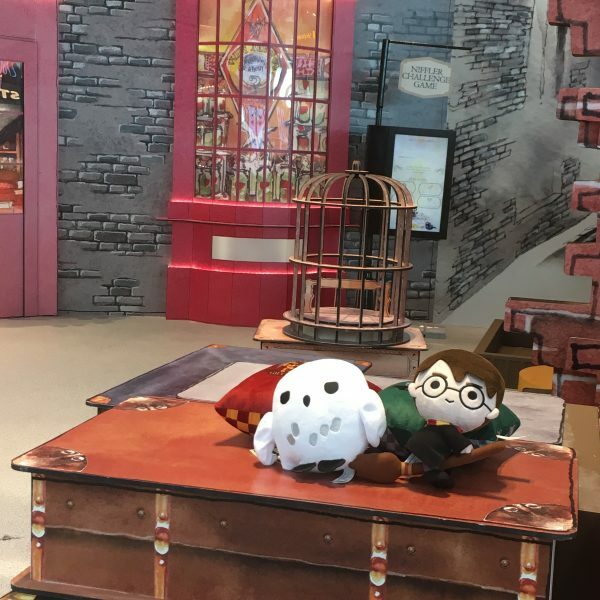 Head down to Basement 2 of Terminal 3 to snap a shot with the huge plushies of Harry and Hedwig, robes and scarves provided too! Over at Terminal 2 Departure Hall, get into the thrilling action of the Ford Anglia car wedged in the Whomping Willow. If you happen to be catching a flight at Terminal 1, look out for the shiny set-up inspired by Newt Scamander’s Menagerie from Fantastic Beasts, at the Transit Hall. Want to take some of the adorable Harry Potter plushies home with you? The smaller versions of Harry, Ron, Hermione, and Hedwig, as well as Hogwarts Houses travel pillows are up for redemption with various levels of minimum spending. It’s a wizarding world holiday extravaganza every Potterhead will love. The Diagon Alley and Hogsmeade Village set-ups are open daily from 10am to 10pm.